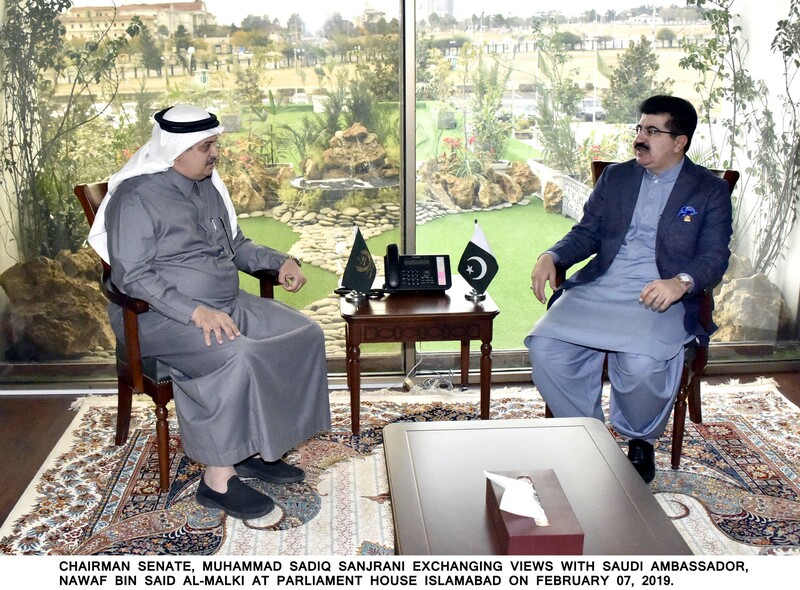 Chairman Senate Muhammad Sadiq Sanjrani has appreciated Saudi investment in different sectors and said that this shows the trust and confidence of Saudi leadership and investors in Pakistan. He further said that trade, economic and investment would help in taking the bilateral cooperation to new heights in the coming days. Chairman Senate expressed these views in a meeting with Nawaf bin Said Al-Malki Ambassador of Kingdom of Saudi Arabia here at Parliament House on Thursday. Sadiq Sanjrani said that the upcoming visit of the Crown Prince Muhammad Bin Salman would further cement and deepen bilateral relations into a broad based multi-sectoral and comprehensive partnership. Chairman Senate also recalled his recent visit to Saudi Arabia and said that fruitful discussion was held with Saudi leadership and both sides enjoy cordial relations at all levels. He, however, emphasized for further promoting parliamentary cooperation and institutional linkages between the two brotherly countries. During the meeting, Chairman Senate also extended invitation to Dr. Abdullah Muhammad Ibrahim Al Sheikh, President of Saudi Shoura Council. He said that the Senate of Pakistan has an active Pakistan-Saudi Arabia Friendship Group aiming to promote enhanced inter parliamentary linkages. Sadiq Sanjrani observed that both sides share ideological and political commonality on different issues and institutional cooperation between the two on multilateral parliamentary foras like Asian Parliamentary Assembly and Inter Parliamentary Union would augur well for both the countries. He said that regional growth and prosperity is a shared objective and we all need to make collective efforts giving peace a chance to flourish and push forward the agenda aimed at regional development. The Ambassador agreed with the views of Senate Chairman. He said that Pakistan is an important country in the region and both countries have enjoyed fraternal ties which have stood the test of time. He also underscored the need for further increase of bilateral cooperation in various sectors and assured his cooperation in this regard.